UPDATE 01/02/2017: The deadline for proposals for the Second MONC Conference has been extended until Friday, 24 February. Many thanks to all those who have submitted proposals so far. Few texts have combined word and image in a more striking or influential manner than Alfred Barr’s timeline of modern art. The chart first appeared on the front cover of the 1936 exhibition catalogue Cubism and Abstract Art at the Museum of Modern Art, New York; through Barr’s direction, MOMA helped to establish the narrative for artistic modernism in the 1930s. This picture has since become one of the most widely-reproduced images of modern art in the western world, one which continues to shape our understanding of modernist art history today. 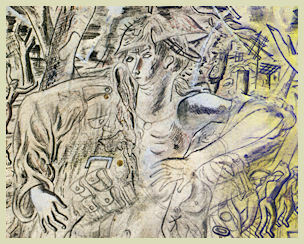 For its second conference, organised in conjunction with Aberystwyth University’s David Jones Centre for Word and Image, the National Library of Wales and the Aberystwyth School of Art, Modernist Network Cymru (MONC) aims to interrogate the symbiotic relationship between the visual arts and the written word, as encapsulated in Barr’s iconic image. How did modernist artists respond to literary texts? How did writers incorporate visual elements in poetry and prose? How did author and artist collaborations arise? And how did modernist texts, from collages to magazines to scrapbooks, combine word and image in radical new ways? The artist and poet David Jones (1895-1974) considered The Rime of the Ancient Mariner to be ‘one of the great achievements of English poetry, and not only great but unique’. In 1929 Jones made copper engravings for an illustrated edition of the poem, and these prints are displayed in the National Museum of Wales, Cardiff this summer as a response to the Coleridge in Wales festival. We are delighted that leading international authority on David Jones, Prof. Tom Dilworth has offered to give this illustrated lecture as part of the Coleridge in Wales journey, in association with Aberystwyth University’s David Jones Centre. Discover how the illustrations by David Jones give fresh insight into the structure and interpretation of Rime of The Ancient Mariner. For more information, or to book a ticket, please contact Luke Thurston (lut@aber.ac.uk). For centuries, Welsh poets and prose writers have depicted the experience of war, either by celebrating victories or mourning defeat. This exhibition focuses on four historic conflicts from the sixth to the seventeenth centuries – both battles and skirmishes. Poignant eyewitness accounts and later reactions by artists such as Aneirin and David Jones, Bleddyn Fardd and Gerallt Lloyd Owen will be shown alongside the narrative testimonies of contemporary and later chroniclers. Let the poets take you to Catraeth, Cilmeri, Bosworth and the Somme. Image Copyright © 2016 Coleridge in Wales Festival. All rights reserved. To mark the centenary of Alun Lewis’s birth, this year’s David Jones Centre conference will explore the work of Lewis and others in the tradition of Welsh writing in and against war. The event will be preceded by a ceremony to unveil a new memorial plaque to Lewis in the Aberystwyth English department foyer. Please click here to download a copy of the conference programme or Poster. Tickets are available via the National Library of Wales. For more information, please contact davidjonescentre@aber.ac.uk.